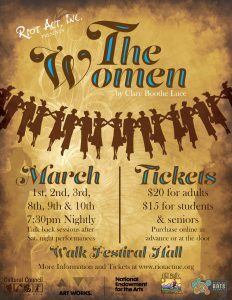 The Women by Clare Boothe Luce – Riot Act, Inc.
Riot Act Inc.’s second production of our 15th season, The Women by Clare Boothe Luce, runs March 1-3 and 8-10 at Walk Festival Hall in Teton Village. 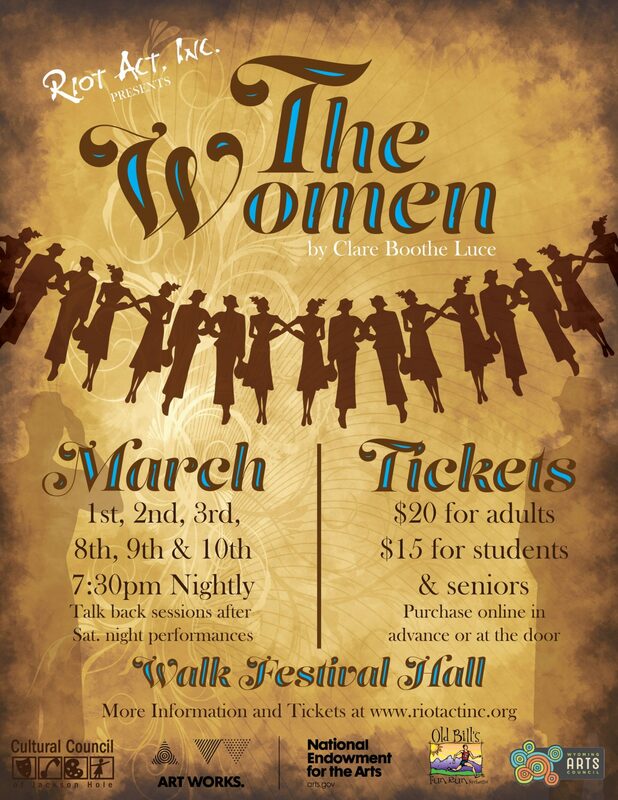 The Women by Clare Boothe Luce: What better way to celebrate a season that focuses on women in theater than this large all female cast production. The author carries us through a number of varied scenes and shows us not only a somewhat unflattering picture of womanhood, but digging under the surface, reveals a human understanding for and sympathy with some of its outstanding figures. The plot involves the efforts of a group of women to play their respective roles in an artificial society that consists of vain show, comedy, tragedy, hope and disappointment. ~ Samuel French. Tickets are available in advance online at www.riotactinc.org or at the door and cost $20 for adults or $15 for students/seniors. Brand new, re-designed Riot Act, Inc. T-shirts, Riot Act, Inc. Stickers and Concessions will be available at the concession stand before each performance and during intermission. For more information, contact riotactinc@earthlink.net. *Project made possible by grants from Wyoming Arts Council/NEA, Cultural Council of JH, Community Foundation of JH, and Your Old Bill’s donations.